Super Dragon Punch!! & Euforic Existence selected as BIMFEST XV openers! While Drangon Super Punch!! was already selected on our first Dark Demons Night, the audience last Saturday chose Euforic Existence as their personal and favorite opener for BIMFEST 2016. With the addition of these last two bands our BIMFEST 2016 line-up complete! Tickets are going realy fast so order now before you're too late! We are happy to announce to you our next confirmed band for BIMFEST 2016… UNDERVIEWER! As fanatic FRONT 242 fans & ranters know already, UnderViewer is actually the pre-FRONT 242project of Jean-Luc De Meyer (head and voice) and mastermind Patric Codenys (keyboards, composer and producer) from before they merged with Daniel B's Prothese to form on of the most successfull and legendary electronic bands FRONT 242. Until this day, UnderViewer never found the time and opertunity to released an full album but this will change this year! While FRONT 242 is taking a sabbatical year, the duo decided the time was ripe to release, come and present their first full album ‘Wonders and Monsters’ at BIMFEST 2016! It's with great proud and privilege we can announce to you the participation of SUICIDE COMMANDO at our 15th BIMFEST anniversary edition! 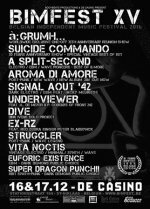 Next to à;GRUMH..., who will come and celebrate their 35th anniversary now also Johan Van Roy will be present a this years BIMFEST to celebrate his 30 years of SUICIDE COMMANDO with a 'best of' show! No need to say this will be a BIMFEST will be another legendary edition to remember! You can still save € 10 / Combi-ticket(*) if you order the now here! 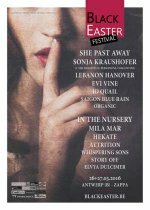 Black Easter Festival will take place as planned! Since some people are wondering if our Black Easter Festival is going to take place we like to say everything will go on as planned, like every other cultural and musical event in Belgium! Unfortunately, Rosa Rubea, the only band who was plannend to fly-in, had to cancel because their flight's got cancelled. 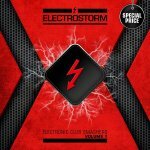 Belgian Minimal/Electro act STORY OFF will fill this gap in the best way they can!